Two years before the action in Lone Survivor, a team of Green Berets conducted a very different, successful mission in Afghanistan’s notorious Pech Valley. Led by Captain Ronald Fry, Hammerhead Six applied the principles of unconventional warfare to “win hearts and minds” and fight against the terrorist insurgency. In 2003, the Special Forces soldiers entered an area later called “the most dangerous place in Afghanistan.” Here, where the line between civilians and armed zealots was indistinct, they illustrated the Afghan proverb: “I destroy my enemy by making him my friend.” Fry recounts how they were seen as welcome guests rather than invaders. Soon after their deployment ended, the Pech Valley reverted to turmoil. Their success was never replicated. 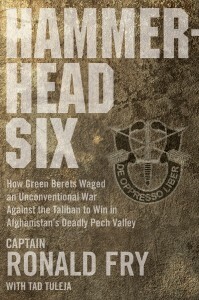 Hammerhead Six finally reveals how cultural respect, hard work (and the occasional machine-gun burst) were more than a match for the Taliban and Al Qaeda.